Tommy Farr was born in BlaenClydach, a mining community that overlooked the town of Tonypandy, in the Rhonda Valley, Wales. Like the rest of the village Tommy’s father, george, was a miner. A big, 17 stone man, originally from Cork,Ireland, who indulged in some bare knuckle boxing to earn some extra money for the family. In 1920 the family had saved enough money to move to a bigger three bedroom house but within three years Tommy’s mother died and his father was bedridden with paralysis. The eight Farr children had to rally round and help one another and the young Tommy did his bit by making deliveries from a hand cart for local shopkeepers. It was almost inevitable that Farr would become fascinated by the boxing which went on all around him. All the local towns and villages had boxing gyms and clubs , and the traveling boxing booths would be constantly passing through. In the 1920’s and 1930’s there was no shortage of young men willing to fight for a few extra pence, and Farr was an avid follower of the fighters. His favorite was Frank Moody, from Pontypridd, who became British light heavy and middleweight champion. 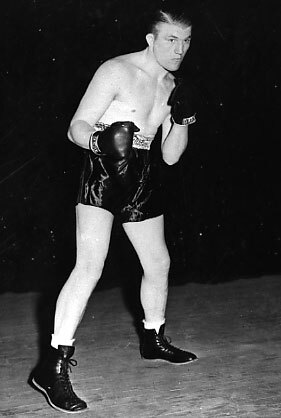 Farr had his first recorded fight in December 1926, in the Tonypandy Square Pavilion, in a show in aid of the Miner’s Strike Committee Canteen Fund. His opponent was a local boy, Jack Jones, who he beat. Then on Boxing Day, Farr outpointed Young Snowball – which was the fighting name of Ted Broadrib, who later became his manager. The strike meant that Miner’s families had no money coming in, so the five shillings ( 25p ) that Farr earned from each fight could be used to feed the family. As soon as Farr was 14, he went to work down the pit, but within a month he was involved in an accident – an explosion causing flying slivers of coal to scar his face and body, marks which he would carry for the rest of his life. The injuries caused a three month break in his boxing, which didn’t seem to be going anywhere anyway. Farr trained at the Dewinton Hotel, Tonypandy, where some of his contests were held. Promoters billed him in a variety of ways; Battling Farr,, Kid Farr, Young Tommy Farr and combinations of these. In 1927, calling himself Young Farr, he issued a challenge in The South Wales Echo to any 84lb youngster in Wales, and he named five. He fought most of them, although not always successfully. One Treorchy lad, Evan Lane beat him three times. Farr went to see Job Churchill who had trained Tom Thomas, British middleweight champion 1906-09, and he became like a father to the young Farr. Despite his numerous defeats, including one knockout, Farr was confident, if not cocky, fighter who always thought he could beat anybody and he extended his challenges in The South Wales Echo. By the tine Farr was 18 he had 78 contests, winning 29 and losing 21. When the youngster had a row with his foreman he gave up his job and went to work for Joe Gess’s boxing booth. However he was not employed as a fighter as Gess said he was too small. Instead he was taken on as a handyman at £1 per week. One day Farr beat up an intruder, a big man who with a knife had slit the canvas wall of the booth. This fight attracted a bigger crowd than the official action. Gess was impressed and finally made Farr a booth fighter. After a few months in the booths Farr became depressed due to the poverty in Wales and the death of his father, after nine years as an invalid, and decided he had to go to London. Money was so short that he had walk to London. Sadly none of the London gyms were interested in him and after scrapping along doing labouring jobs he returned home. With Job Churchill’s help he resumed boxing and Joe Gess began promoting him in matches for decisions. At first he had no more success than before, but then he beat a good heavyweight Jim Wilde, and started to look like the real thing. Farr’s brother, John, persuaded a local matchmaker to give Tommy a fight with the Welsh middleweight champion Jerry Daley.It was a warm up fight for Daley, who was facing Charlie Bundy the following night and although Farr was 10-1 against in the betting he drew over 15 rounds. When Daley, who had been cut over the eye, could not fight Bundy, Farr took his place and won on points. Nearing 20, and still popularly known as kid Farr, he was developing into a very useful light heavyweight. Farr finally got his chance in London when standing in as a substitute against Eddie Steele at Crystal Palace. He was losing a dull fight when a punch to the neck caused his new gumshield to slip and block his throat. In panic he leapt from the ring and rushed to the dressing room where a thump on the back expelled the gumshield. He then returned to the ring to find he had been retired. This event caused much publicity and he returned to Wales in some disgrace. However he quickly won seven straight contests after this and then challenged Randy Jones for the Welsh light heavyweight title in Tonypandy . It was a good close battle with Farr the winner on points. He then beat the ex Irish middleweight champion Jack O’Brien in Belfast. By now Farr was a busy fighter and had 28 fights in 1933, losing only three, and was earning a living with his fists. In February 1934 Farr got a chance to wipe out the bad impression of his fight in London when matched with Light heavyweight Eddie Phillips who had lost to Len Harvey for the vacant British title eight months earlier. Farr had Phillips down twice in the first round, but again there was nearly another Farr fiasco. When Phillips hit Farr after the bell in the third, the two men nearly carried on the fight unofficially and the referee, Moss Deyong, had to give them a stern talking to. The fight changed in the seventh, when Farr was dropped and suffered a cut eye. After 15 rounds Phillips took a close decision, but Farr’s reputation in London had been considerably improved. 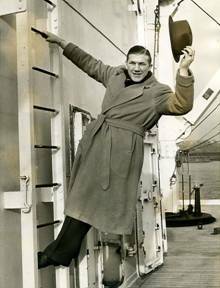 Ted Broadrib had been impressed with Farr’s showing against Phillips and he suggested to a small Wandsworth promoter, Jim Wicks ( who later managed Henry Cooper ), that he should match Farr with Phillips in a final eliminator for the British light heavyweight title. The contest took place in June 1934, Farr having first agreed with Broadrib that he should look after his affairs in London, but Farr was disqualified for a low punch. All his protests were in vain and Farr was reduced to tears. Although the fans gave him an ovation, Farr, being the man he was, grew angry at what he saw to be a robbery. Farr continued to successfully defend his Welsh title. He was then handed a surprise shot at the British light heavyweight crown when the holder Len Harvey decided to relinquish the championship, having recently won the British heavyweight title. Farr was matched with Eddie Phillips, in February 1935, for the vacant crown and, with the fight arranged for Mountain Ash, Wales the local man had a wonderful chance to take the crown and gain revenge over Phillips in front of a Welsh crowd. Sadly Farr injured his right hand in training four days before the fight. Facing a £100 forfeit for pulling out, Farr’s camp decided to keep the injury secret and gave Farr cocaine injections to control the pain. Farr thought he could win with one hand. Having interrupted his training, Farr found he was also five pounds over the limit on the eve of the fight, so he had to get rid of this by weigh-in at lunchtime the next day. Not surprisingly Farr faded badly in the fight, particularly after getting cut in the fifth round, and Phillips took the 15 round decision. Farr was not yet 22, yet he had now had 133 contests, and had lost 33 of them. It seemed that he always made a mess of his best chances, and he was clearly at a stage where his career could go anywhere or nowhere. He decided to ask Ted Broadrib to manage all his affairs. Broadrib agreed, but only to an American style contract, which would tie him to Farr for five years. The contract guaranteed that Farr would earn a certain sum within a year. Broadrib wasn’t sure if Farr would be a satisfactory meal ticket, was determined that if Farr didn’t progress and earn the stipulated sum then he could be free of him. Such agreements caused fighter and manager to have more than their fair share of rows during their partnership, but at least Farr’s career was finally about to step up a gear. When Ted Broadrib took over Farr’s affairs, the first thing he did was base the fighter in Slough, Berkshire, where he could live and train at the Dolphin, home to many of the day’s leading boxers. Farr used to say that it was only when he arrive at The Dolphin that he started to train seriously. Broadrib immediately got him fights in London with improved purses and he beat Manuel Abrew at White City, and Eddie Wenstob at Holborn. In his last fight of 1935 he knocked out his boyhood hero, the veteran Frank Moody, then 35, in Cardiff. Farr was popular in Slough, but was angry that he couldn’t get big fights in London. Promoters thought he lacked box office appeal, but he got a chance to put this right when former light heavyweight champion Tommy Loughran came to London. The American was now campaining as a heavyweight and had recently lost to Primo Carnera for the world title. Promoter Jeff Dickson saw Farr as an easy opponent Loughran. At first Loughran outclassed Farr but by the last two rounds Farr was well on top. When Farr got the verdict there was uproar from Loughran’s manager and booing from the fans. The next fight was delayed by ten minutes such was the uproar. Farr was not too worried about the controversy as the result meant that he was becoming noticed and offers of more fights soon followed. He was soon in dispute with Broadrib over his share of the earnings, but Broadrib had him tied to a contract and there was little that Farr could do. However no matter what Farr thought of him Broadrib at least had the knowledge and connections to get him better fights. In April 1936 Farr fought another American Bob Olin, like Loughran a former world champion at light heavy. As with loughran it was a close fight with Farr’s straight left countering the American’s all round punching and ringcraft. Farr was down in the fifth and ninth but got the decision. Farr badly wanted to fight fellow Welshman Jack Petersen, who had won the British heavyweight title in 19934, but Petersen avoided him. So in May 1936, Farr fought Jimmy Wilde in Swansea instead. Farr planned to go to America to fight afterwards but cancelled when the referee announced a draw. Farr felt even worse when Petersen agreed to fight Ben Foord, instead of him for the British title. The best Broadrib could arrange was a return with Wilde for the Welsh heavyweight title, the fight would also be recognized as an eliminator for the British title. The venue was again Swansea, and Farr boxed as well as he ever had in this fight to knock out Wilde in the seventh. Farr was now earning well and after this fight he moved out of The Dolphin and bought a house half a mile away, inviting his sisters Sally and Phylis to join him there. In August 1936 Foord stopped Petersen to win the British and Empire heavyweight titles. A match was at last fixed between Farr and Petersen, but when Petersen lost to WaalterNeusel and announced his retirement, thereby avoiding Farr to the end. However Farr got his chance to challenge Foord for the British and Empire tiles and took them from him in March 1937. It was the start of a purple patch for Tommy Farr. When Farr returned to the Rhondda there were 2,000 people at Tonypandy Station to meet the Champion and 20,000 cheered him through the streets, in an open topped car, on route to a civic reception. Promoter Sydney Hulls had a contract with Max Baer for the American ex world heavyweight champion to fight in London in 1937. originally Hulls had intended to match Baer with Petersen, but know Farr was the only possible alternative. The pair met a month after Farr had beaten Foord and once again the Welshman won with an impressive performance. While ex world champion Max Schmelling fought only three times in three years, another German, Walter Neusel, had been coming to Britain regularly beating British heavyweights, including Petersen ( Three times ) and Foord. Hulls arranged for Farr to fight Neusel in June and he earned £5,000, his biggest purse yet. Once again Farr was the betting underdog but, as always, he was superbly confident and bet on himself winning by a knockout. After a fast start, Farr had Neusel staggering by the end of the second round. He shot out of his corner in the third and cut Neusel’s cheek, so that his face became red with blood. Hooks to the stomach sent Neusel reeling and a left and right to the head had him pitching to the canvas where he managed to get to one knee before being counted out. Farr was now a true world title contender but the heavyweight division was in a curious state. Schmelling had beaten Joe Louis, and in the eyes of the world earned the first crack at James J Braddock’s title. He had even signed a contract to meet him. But fearing that if Scmelling won the title it would be lost to Germany because of the war that was brewing, promoter Mike Jacobs made an offer to Braddock to fight Louis, which effectively pushed Schmelling aside. Ignored Jacobs, so when Louis won the title, Jacobs decided to offer Farr a shot at the world title. Although he lost, Farr put up a terrific performance and helped by the fact that millions of fight fans in Britain listened to a biased radio commentary, the name of Tommy Farr entered boxing legend. Before the fight, Farr had gone 21 fights without defeat. After losing to Louis he returned to America for four fights and lost them all, yet even this did little to ruin his popularity on either side of the Atlantic. In January 1938 Farr fought James J Bradock, then in March fought Max Baer in a return before fighting Lou Nova in December, finally, in January 1939, Far lost a split decision to Clarence “Red” Burman. By now Farr was married and he and his wife and daughter lived in Brighton. In 1942, a son was born and Farr kept himself busy, buying property, running a pub, opening a restaurant and trying unsuccessfully to be nominated for the local council. In 1944 Farr had a second son, but within five years he was forced to sell the family home and move to a smaller one. In 19950 he gave up his restaurant and was thought to be almost bankrupt. It was for this reason he was forced to make a return to the ring. When he fought an exhibition in August he had been out of the ring for ten years. Neverthe less, three wins and two loses later, Farr won back the Welsh heavyweight title, in July 1951, by stopping Dennis Powell. Nine fights and seven wins later Farr fought Don Cockell in an eliminator for the British title, and lost. He was 40 and it was his last fight, he had faced many court appearances over unpaid debts in the 1950’s but his ring comeback and a boxing column in the Sunday Pictorial, which lasted till 1961, helped him settle them. The farr’s celebrated their Ruby wedding in 1979 but on St David’s day, 1986 Tommy Died. After his death an autobiography that he had written before his comeback was found. It was edited by his son and published in 1990. Tommy Farr, like so many of his fellow countrymen, was born into poverty leading to the inevitable job of working down the coalmines, before his teens. In those days of appalling conditions in the mines and poor pay no-one liked working there but Tommy particularly disliked it. Boxing was his means of escape, a decision he was to later describe as 'the lesser of two evils'. So he followed the route that Jimmy Wilde & Jim Driscoll had taken before him; he joined the boxing booths. At the tender age of 12, already having left school, he engaged in his first official fight - a six round points win over Jack Lord set Tommy on his way. Tommy didn't set the world alight in his early career. He decided to try his luck in London, this did not work out for him either having only one fight, against Eddie Steel, which he lost. On his return to Wales at last fortune smiled upon him, putting together seven straight wins he then took the Welsh Light-Heavyweight title with a points win against Randy Jones. Another six wins (making it 14 straight) led to the first of 3 meetings with Eddie Phillips, all of which Tommy lost. The last of these 3 meetings was for the British Light Heavyweight title which was lost over 15 rounds. After this fight Tommy was to reach a turning point in his career. During a string of 18 fights without defeat Tommy Farr beat ex-World Light Heavyweight Champion Tommy Loughran and Bob Olin, another former light heavyweight champion. Even with his growing reputation Tommy was not expected to defeat Ben Foord in a challenge for the British & Empire titles in March 1937. The fight wasn't a classic but Farr's crouching style and consistent scoring with the left hand secured the titles. After a somewhat mixed beginning to his career Tommy was now British & Empire Heavyweight Champion and ready to mix it with the best the world had to offer. The next opponent for Farr was Max Baer the great former World Heavyweight Champion. Understandably, Tommy was the underdog; Max Baer was going to beat him and beat him easily - or so Max thought. Tommy turned the odds upside down with a great display of boxing, while for the most part Max Baer played to the crowd. Mistakenly, Max thought that he could finish Tommy Farr whenever he so chose. When the time came that Max thought he would now put an end to the Welshman's challenge he found himself in a real fight. By now Tommy had established a commanding points lead and was not about to give it up. Max moved in for the kill; Tommy jabbed him - Max threw big right hands; Tommy jabbed him - Max tried to box; Tommy jabbed him. Tommy was fighting a great fight dancing, crouching, bobbing and weaving, jabbing and when Max did manage to get in some good punches Tommy fought back An absolutely tremendous performance saw Tommy Farr take the points verdict in his best win yet. With another superlative performance Walter Neusel was dispatched in only 3 rounds leading up to the epic battle with the great Joe Louis. Making his first defence of the World Heavyweight title, which he had taken from James J. Braddock, the Brown Bomber was expected to deal with Tommy Farr more than comfortably. Louis himself saw the fight as nothing more than a warm up for stronger opponents who would undoubtedly challenge him. No-one outside of Wales gave Tommy the slightest chance of winning. America was looking forward to a convincing and early finish to the fight. Tommy Farr had not read the script ! Before a crowd of 32,000 in New York, Tommy Farr gave the Brown Bomber the fight - and fright - of his life. Back in Wales it is said that almost every house in the land was listening to the fight on the radio that night. At the bell battle commenced with Tommy unexpectedly taking the fight to the champion. Louis was strong, powerful and a fearsome puncher, surely these were not the tactics for Tommy to adopt ? While respecting the champion Tommy bore forward continuously and for 15 rounds war was waged between the two great men. The fight was close with Louis cutting Tommy up badly in an enthralling battle. At the end Louis was declared the winner and still Heavyweight Champion of the World. Tommy Farr had lost but had won the respect of the world and earned a place in boxing history. He was still only 23 years old but had been involved in more than 200 fights, including boxing booth bouts, when he faced Louis. There is a popular story told in Wales, that when Louis noticed the scars on Farr's back at the weigh in, (which were a result of Tommy's days in the coal mines) and asked him how he had got them, Tommy is said to have replied, " Oh, they're nothing, I got those from fighting with tigers ! 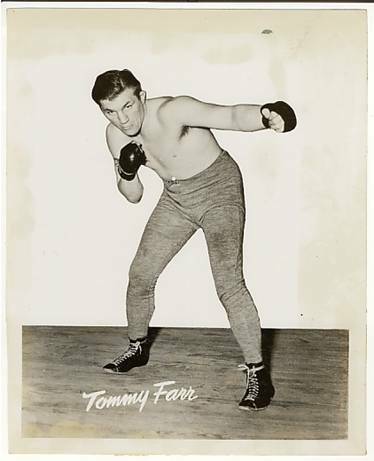 "Tommy Farr was celebrated throughout Britain, a charismatic and popular figure, he later returned to America for 4 more fights all of which he lost on points. Upon his return to Britain he was stripped of the British title for not defending it when requested to do so by the British Boxing Board. 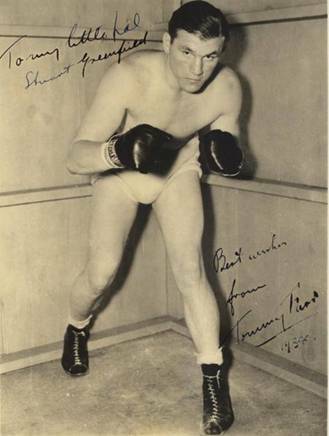 Tommy fought four more bouts, all wins, before retiring in 1940. Although Tommy Farr was a wealthy man when he retired in 1940 he was facing bankruptcy when he made a comeback ten years later, at 36 years of age. He regained the Welsh Heavyweight title but finally ended his career, 3 days short of his 39th birthday, when Don Cockell beat him in 7 rounds in Nottingham. After his defeat Tommy took the ring microphone and sang the Welsh national anthem - a fitting finale to his career. Louis came out on his toes but Farr made the first lead, forcing Joe to give ground as he connected with a snappy left hook to the head. Tommy moved in and out of range quickly, shifting his lead from the head to the body while Louis sparred cautiously. They exchanged light lefts to the head, then Farr jabbed the champ three times to the face the crowd roared as the Englishman showed plenty of fight. Louis forced Farr to give ground under left hand punishment Joe pumped his left with great rapidity to the face and had the Welshman blinking. The champ blocked Tommy 's body attack and continued to pour lefts to the challenger's face Farr appeared considerably baffled as he went to his corner. Louis' round. Farr threw an overhand right that curled harmlessly around the champ's neck Tommy then dug both hands to the head and jarred Louis with a choppy right to the head. Louis missed twice with his left and they clinched in Farr’s corner. They exchanged long lefts in midring while Tommy tried hard to find an opening in the champ's defense Joe continued to use his left jab almost exclusively. He was beating Tommy to the punch consistently Tommy lowered his head and charged in, landing a hard right to the body and grazing Joe's chin with another. Louis opened a deep gash under Farr's right eye. The crimson was flowing freely as Tommy went to his corner Louis’s round. Farr carne out in a crouching stance, throwing a short left to the body as he clinched. Louis picked off most of Farr's punches before they landed and began further execution with his long snakelike left. Farr connected with a short right to the chin but Joe did not even blink as he went methodically about his work. Louis speared Farr a half dozen times with his left without a return Tommy kept on the move, meanwhile being wild with most of his counter punches After sparring at long range. Louis jolted the challenger with a short right hook. They were sparring at the bell Louis' round. Louis landed three light lefts to the head Farr circled the champ in midring Tommy was short with both hands Louis again began pumping his left to the challenger's face. The crowd became restive and whistled for more action. Louis pulled away from a long right and shook Farr with a hard counter punch to the head Tommy swung a hard right to Joe s head but took two terrific smashes in return The challenger was bleeding from cuts under- both eyes as Louis stalked him Joe dug his left to the body and forcer! Farr to retreat In some distress The challenger gamely charged in but Joe had no difficulty tying him up as the bell rang Louis’s round. Farr backed off and carried his left shoulder high to help protect his chin Tommy's left miss fired but he connected with a short uppercut to the champ's chin Joe blinked but quickly began jabbing and keeping his opponent off balance Tommy threw cautions to the winds as he leaped forward, punching with both hands but escaped serious damage for the time being Tommy brought a roar from the crowd as he landed both fists to the Jaw. The challenger was finding the range more often with his left and had the champ Somewhat puzzled. Joe covered the next time Tommy rushed and made no attempt to counter punch The crowd was cheering the challengers rally wildly as the bell rang. Farr's round. They exchanged lefts In midring Farr rushed the champ aggressively but was jolted by two hard lefts to the face. Louis missed with a terrific left hook but punished Farr as he forced the challenger from one corner to another Tommy could not keep his face from Louis' left and blood again began to stream from the challenger's cuts Tommy roughed Joe as they leaned their heads together near the ropes They exchanged short lefts to the head Louis opened up and let drive with both hands The champ beat his opponent unmercifully Tommy's face was a bloody mask but the challenger hung on gamely. Louis ducked a hard right hook just Before the bell The crowd gave Farr an ovation as he went to his corner Louis’s round. Tommy circled the champ in midring They exchanged light lefts. Farr let fly with a round house left that caught Joe's neck harmlessly Tommy charged In twice connecting with lefts, while Joe took his time and waited for an opening The champ shifted to the body but then backed away as Tommv again charged forward Joe pumped his left to Tommy's face three times but Farr rallied and had Joe blinking with_ a series of hard smashes to the head the crowd was in an uproar as the challenger carried the fight to the champ and staged another game rally Tommy grinned at his handlers as the, wiped out the blood off his face. Farr's round. Tommy led briskly with his left as they met in the center of the ring There was a slight swelling under the champ s right eye Louis opened a fresh flow of blood from under the cut under his rival s left eye but Tommy retaliated with both hands hard to the head. Tommy forced Joe to give ground and punched the champions body with both hands in a neutral corner Farr forced Louis to the ropes where they clinched Tommy kept throwing his left and was beating Joe frequently to the punch Louis backed away after Farr landed both hands solidly to the face They exchanged light lefts In midring just before the bell Farr's round. They sparred in the center of the ring before Farr forced Louis to give ground ,with a left to the ribs Tommy swung with both hands to the head and continued to keep the aggressive. Tommy took a stiff left as they came into the clinch. Joe began to find the range again and clouted the challenger with a right hook to the ear. Both kept busy with their lefts Joe again countered with a right but barely escaped being nailed by a right hander that Farr brought up from his knees. Tommy's next rush was stopped short by the champ's solid right hook The champ staggered Farr with both fists to the face just before the bell. Louis' round. Louis worked his left briskly to the head and tried hard to find an opening. Farr refused to stay m one spot, however, and outpunched the champ in a brisk exchange along the ropes Farr got in some effective punches with his left hand after narrowly escaping a terrific Louis right that had havmaker written all over. They speared each other with lefts Farr s face was well smeared with blood again but the challenger repeatedly rushed forward as he continued to force the fight Tommy landed a right hook to the champ's face just before the bell. Round even. Louis jabbed quickly three times as Farr cautiously circled the champ Tommy stuck to his protected crouch and was taking fewer chances. The challenger missed a long right but Joe connected with a choppy right hook They exchanged a dozen long lefts before Louis bounced away from an overhand right Farr's next right hand sailed harmlessly over Louis' head. The champ shot a hard right to the face but Farr refused to give much ground Tommy chased Joe halfway across the ring, swinging his right, but failed to connect Louis jabbed Farr briskly with his left just before the bell Louis' round. 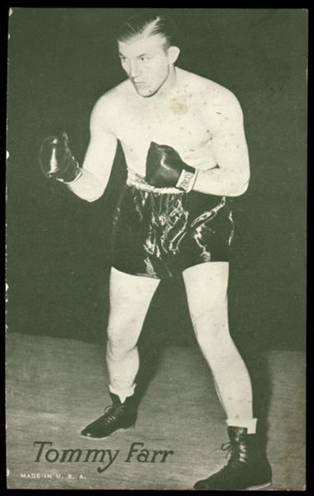 Tommy Farr, that stout Welsh fighter from the coal mines, violated every tradition of British prize fighting here Monday night by remaining vertical for 15 rounds, under a withering fire from the left glove of Joe Louis which left the Welshman’s face a scarlet mask. Louis won the fight handily, and kept his title of heavyweight champion of the world, but Farr stole the show. Reeling and glassy eyed in the closing rounds, he kept fighting back—lurching right into Louis’ fire, his chin thrust ahead of his dragging feet, throwing futile punches, winning yells of admiration from the crowd. Tommy’s gameness was enormous. A time came before the fight was half over when every punch that Louis landed must have jarred the Welshman’s brain and shaken the bruised bones of his body. The end of the 14th round found him slightly punch-drunk. Maybe the brandy they were feeding him in his corner had something to do with it. Anyway, he staggered into the ring before the bell rang to start the 15th, and Tommy Evans, his trainer, bawled “Come ‘ere, Tommy, come ‘ere.” But Tommy wandered like a lost dog until the gong clanged, and then, wide open, he fought off Louis’ final charge by instinct. It was a heroic achievement for a British fighter, and it constituted the major sports upset of the year. There was no sprinting backward, none of the track meet stuff that marked Bob Pastor’s fight with Louis. Farr came in and fought his best from start to finish. Remember Joe Beckett and Phil Scott? And Bombardier Wells? Those famous British swooners must have winced over their tea and scones when they heard that a son of the empire had so far forgotten himself as to stand up for 15 rounds. Maybe a better Joe Louis would have stopped the taffy haired “Welshman. Joe didn’t fight too well. He was sleepy and his punching, his hooking lacked sharpness Its possible he was affected by the four Day postponement of the fight from Last Thursday . But that strips none of the luster from Farr’s performance. He had courage and Shrewdness and agility. He lacked Only one thing – a punch. Three or four times, in the course Of the rolling, deceptive rush at the champion, He landed a right hand on Joe’s head. These blows made Joe crouch and cover up, but they didn’t hurt him. Farr has no hurting power In his glove. It’s a pity, too, because he has an appetite for fighting. The Welshman outweighed Louis by 204 ½ to 197. He entered the ring in a camel’s hair bathrobe with a red dragon embroidered on the back He smiled while a couple of hundred champions and former champions—Dempsey, Tunney, Jack Johnson, Baer, Braddock, Barney Ross, Marcel Thil, Sixto Escobar, and others—paraded across the ring. Then his face turned solemn. The bell rang, and the thing was on, and people waited to see Joe Louis blast the British champion into the state of coma. There was a cut under Farr’s left eye, with a patch on it. And Louis made this the target of his flicking, wounding left jab. Before three rounds were over, Farr was bleeding from both eyes. Joe finally landed a right in the fifth round, and it seemed to hurt Tommy. But he fought back. He weathered a savage storm in the seventh—eight clubbing left hooks and six rights. He was-lurching and reeling, but he stood up. Then to the amazement of all hands, including the sleepy champion, Tom began to carry the fight. He won the eighth and ninth and eleventh rounds by confusing Louis with sudden rushes and oft time lefts to the face. All this while, however, Joe kept poking at those red eyes. By the end of the 13th he had the Welshman built up for the kill, and he punched him glassy eyed with a short right hook that slid an inch below Farr’s guard. The bell saved Thomas from trouble this time, and his courage and Joe s sleepy bewilderment kept him vertical—and treasonous, by every British code of law—for the last two rounds. The crowd, which thought more of Farr’s wild rushing than it did of Joe’s deadly jabs, booed to the high heavens when the decision of Referee Arthur Donovan and the two judges, Charlie Lynch and Kid McPartland, was announced I think the fans must have known that Louis won. but they didn’t like the way he performed And the truth is, he didn’t perform like a champion of the world. But you must consider how tough a man this wild Welshman is. He ran Max Baer dizzy He is smart, and strong, and peculiarly elusive. There is no way of gauging his style in 15 short rounds. You have to fight him all day to dope him out. And that would be no pleasant chore. At the end, he snarled out at Referee Donovan for grabbing his hand and chiding him about low blows as he walked to the corner. He made a little rush at Donovan, and Donovan snarled back. Then the brief spat subsided. It was somewhat silly, but it showed that Thomas Farr was very conscious. This was a breach of etiquette, for etiquette requires a man to be very unconscious when he is thru fighting Louis. My scorecard gave 12 rounds to the champion and three to Farr. More important, the promoter Uncle Michael Jacobs gave $50,000 to Farr. Tommy can joy himself for the rest of his life by dividing that sack of pound sterling into shillings and pence.